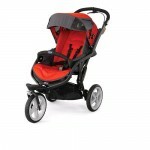 The Chicco S3 All-Terrain, 3-wheel stroller simplifies on-the-go lifestyles for active families. Puncture-resistant EVA tires, a 10 in. front swivel wheel for easy maneuvering and adjustable rear-wheel suspension ensure a smooth ride for baby on a variety of surfaces. The included all-weather insert is reversible with warm fleece on one side and breathable knit on the other for extra comfort in warm or cool weather. A 5-point harness and multi-position, fully reclining seat keep baby snug and comfortable while the hand brake and linked rear brakes keep you in control. The S3 is the picture of convenience with a detachable backpack with water bottle holder and adjustable canopy with zippered pocket for all baby’s things. Travel and storage is slim and easy with a compact, freestanding fold and quick-release front and rear swivel wheels. Other features include: large storage basket and 5-position height-adjustable handle. Create your own travel system with the #1-rated Chicco KeyFit or KeyFit 30 infant car seat! For use with children up to 40 lbs. I LOVE my S3 stroller. I have the cubes car seat and it goes great with the stroller to make a travel system. I use it for Strollfit classes and it works great. It’s definitely a smooth ride. Way smoother than using a regular stroller. 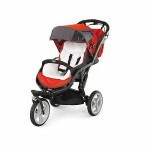 I had the cubes matching cortina stroller, but exchanged it when it came out. I do wish it was a true jogging stroller though esp. b/c of the price. I could of gotten a BOB for the price of it, but I wanted a stroller that fits with a Chicco car seat. I love it & it’s high quality so it’s worth the price. I love the color & the backpack it comes with as well. I do wish the bottom basket was a little bit larger though.